Happy Friday everybody! Before you prepare your Justin Timberlake “It’s Gonna Be May” Memes for Instagram, we have one more weekend in April. Why not kick it off with a little girl power? Get ready for a night on the town or a night in with your best gals by watching some of our fave girl group music videos! From Destiny’s Child to Fifth Harmony, you’ll be cueing the fire and praise hand emojis. 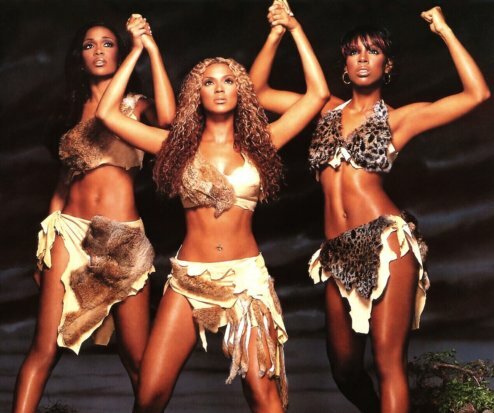 1 – Destiny’s Child – “Survivor” – Not only is this a total female empowerment anthem, but the ladies rocked that camo life so hard. 2 – TLC – “No Scrubs” – Come on, ya’ll… you know you were a sucker for these “futuristic” music video vibes. And let’s give a secondary shout out to Left Eye’s abs. 3 – Spice Girls – “Wannabe” – The world’s introduction to this UK girl group is just a lovely ’90s romp through a bougie hotel and the perfect introduction to all their personalities. 4 – En Vogue – “Don’t Let Go” – This power ballad and super emotional jam was all over VH1 back in the day. It’s totally worth it just to see their fierce outfits. 5 – Fifth Harmony – “Work From Home” – Ahh the good ol’ days when Camila Cabello was hanging with her girls. If you want to see absurdly buff construction workers, this is your outleft. 6 – Salt-N-Pepa – “Shoop” – The outfits, the dance moves, the Mercedes Benz convertible… this is pure gold and will absolutely give you fashion inspo.